The 4-post hydraulic press, which is often referred to as a 4-column press, is super-rigid. It can tackle precision jobs, day after day, year after year. Take a closer look at how the many advantages of the 4-post hydraulic press. The 4-post hydraulic press is less expensive to operate than a gib-guided press. This saves you money in day-to-day operation. The design of the 4-post is highly flexible, which makes it a cost-effective choice for the long term. Using modular tie-rod design, it can meet the specific needs of your most demanding customers. They operate with highly accurate bed-to-ram parallelism. It hurts to turn away work, especially when your job flow tends to fluctuate. When you invest in a 4-post hydraulic press, you can go after a range of jobs with difficult specifications. You can take on exacting, but high-paying projects, knowing the 4-post press will deliver reliably. These presses work with dies of all sizes. With their modular design, they are easy to customize for specific requirements. Workers can make use of its four-sided access for smooth transitions and ease of operation. The 4-post is available at virtually any tonnage and bed size. This lets it handle the widest range of jobs. With its long bearing length, it can handle off-center loading with ease. The 4-post hydraulic press has a design that gives it consistent die alignment and reduces deflection. You can pump out work that is uniform and precise, time after time. The frame is heavy, which keeps it rigid and stable. The parts you produce with it stay accurate, however demanding the specifications. Setup is fast and maintenance is easy. They provide many years of trouble-free production. 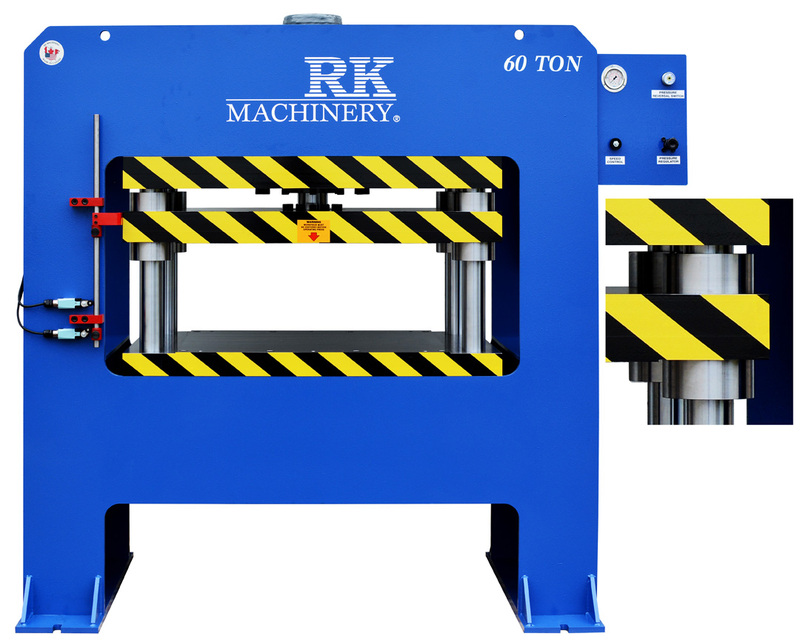 Since 1980, the team here at RK Machinery has been producing the highest quality hydraulic presses for buy machine shops like yours. Our presses are known for innovation, safety and dependability. Our prices are competitive and our presses have a reputation for dependability. We make a variety of hydraulic presses, including the 4-post H-frame and C-frame. They are manufactured with pride by craftspeople who understand presses from the inside out. As standard equipment, each press comes with numerous features that are in-demand by machine shop owners and operators. We also offer you an array of options that make each press more versatile. We understand that many shops have customers that have highly precise job specifications. That’s why we have a team ready to customize our presses to meet your specific needs. Our designers can help you figure out exactly how to modify a press so it lets you deliver the job your customer demands. Our production team will produce the press that fits your requirements exactly. Whatever you need, we can deliver. Our team has the experience to tailor the press to satisfy the most exactly requirements. Call RK Machinery today to learn more about the many advantages of the 4-post hydraulic press. Our team can answer your questions and give you a free, no-obligation quote.